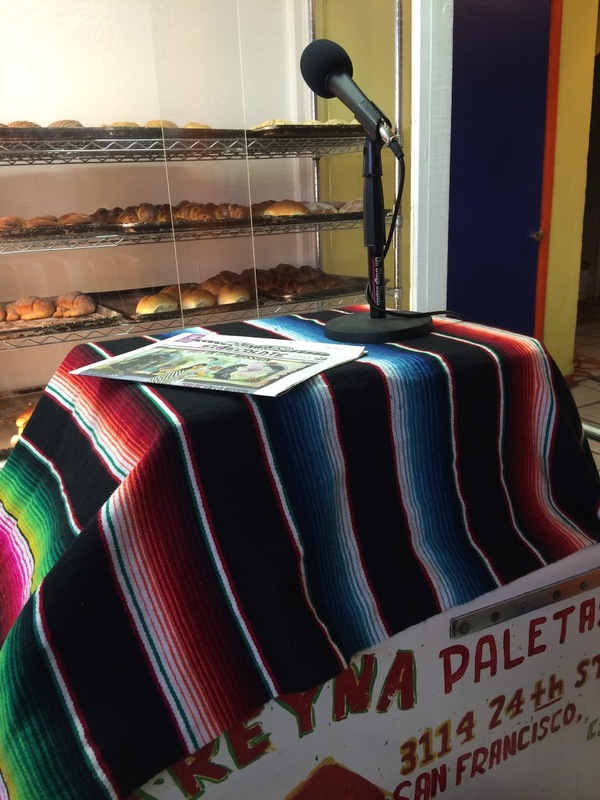 I recently attended a poetry reading inside a panadería, a Mexican bakery, in the Mission District of San Francisco. As a source of after-work, mid-week adventure and to support a friend who was reading, we drove into the city. We were introduced to poets who feel so deeply for their culture, and they told stories about the lives they lead that fit into in the mile and a half of the city. The bakery, one of many along 24th street was simple, and not unlike the other eight that were on the next few blocks. The usual custom is for patrons to walk in, pick up a set of metal tongs and a tray, and make their careful selections from rows of conchas, galletas, and coronitas, flecked with sugar and sprinkles. Trays become heavy with brightly colored cookies and yeasted breads, then taken up to the front counter, which is usually adorned with statuettes of the Virgin Mary and other deities. The signature white bag of a panadería is then rolled at the top, and handed back to the eager-bellied man, woman or child who will bring their bread home to share, or eat on the go. Pan dulce is usually eaten with company, and served with a cup of coffee, un cafecito, delicately spiced with cinnamon, or simply with cream and sugar. Stories are told around a big plate of pan at the center of the table, and the crumbs hold laughter and memories. It is a sacred ritual, a task that is taken seriously when you know you will have late conversations with loved ones and are going to need something tasty, or as something to have on-hand to offer unexpected guests. Considering all of the routine that occurs within the bakery on a daily basis, on this particular night patrons were surprised, and even confused by the rows of chairs, the amplifier, and the microphone situated on top of a zarape that was draped over a paleta cart, bells and all. It was such a lovely evening in San Francisco, warm and pleasant. This almost never happens, and when the reading began, we were treated to words, flour, butter, and sugar—my most precious combination. That evening, the pleasant aroma of sugar and flour permeated the air, and infiltrated my olfactory senses, taking me back to a panadería in Mexico I had gone to while visiting my grandmother as a teenager. It smelled exactly the same. I had to reverse engineer this cookie, making it gluten-free. It is my wife’s favorite pan dulce and she hasn’t had one since becoming gluten-free. *If you are using a different gluten-free flour blend, make sure that there is a higher ratio of cornstarch in it, or adjust the recipe to include more cornstarch. This creates the soft, crumbly texture in the polvorones.